Home Articles News Scientific publications 3 days of 'free-of' cosmetics: less endocrine disruptors in the body! 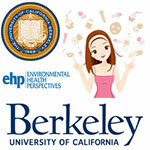 A study led by researchers at UC Berkeley and Clinica de Salud del Valle de Salinas demonstrates how even a short break from certain kinds of makeup, shampoos and lotions can lead to a significant drop in levels of hormone-disrupting chemicals in the body. The results, published in the journal Environmental Health Perspectives in March 2016, came from a study of 100 Latina teenagers. The Health and Environmental Research on Makeup of Salinas Adolescents (HERMOSA) study is a community-university collaboration between UC Berkeley, Clinica de Salud del Valle de Salinas, and a team of youth researchers from the CHAMACOS Youth Council, a project to involve young people in public health and the environment. Researchers provided teen study participants with personal care products labelled free of chemicals such as phthalates, parabens, triclosan and oxybenzone. Such chemicals are widely used in personal care products, including cosmetics, fragrance, hair products, soaps and sunscreens, and have been shown in animal studies to interfere with the body’s endocrine system. ‘We know enough to be concerned about teen girls’ exposure to these chemicals. Sometimes it’s worth taking a precautionary approach, especially if there are easy changes people can make in the products they buy,’ said Harley.